Buy raw steel wall switch plates and outlet covers for an industrial look in modern residential and commercial installations. Please contact for additional sizes. Complete the look of a rustic or industrial decor living space with raw steel wall plates. Raw steel plates look great on shiplap walls, subway tile or as a contrast to reclaimed wood shelves or accent walls. If your loft or home features industrial hardware, these raw steel covers will be the perfect finishing touch to decorating your room. 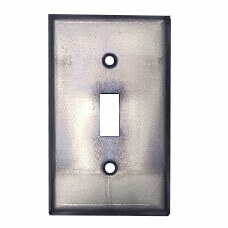 These rustic, unfinished switch and outlet covers are made in the USA with .030" thick cold rolled steel. Finish is smooth with manufacturing marks & color variations visible. This finish is the best choice if you plan to paint your switch plates to match a wall or unique trim color. See our Switch Plate Painting Tutorial for tips on getting the best results.